In late July, a news story surfaced about Dr. Richard Graham, a psychiatrist who is seeking to open in-game counseling services in World of Warcraft. 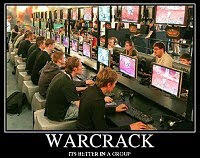 The claim was that World of Warcraft is more addictive than crack – and there's certainly some evidence that players have, at times, taken their virtual world experiences too far. There's the real world cases of stabbing upon selling a sword loaned in-game, the suffocation death of a 4-month-old child due to parents neglect while playing World of Warcraft in an Internet Cafe, and a player committing suicide because he couldn't beat his addiction to EverQuest. There are dozens more cases, and at least half a dozen studies, about the addictive nature of virtual worlds. I'm not talking about these kinds of addicts, though, who suffer that kind of serious addiction that needs real world therapy to work out an addictive pattern that has become psychologically ingrained into the player. I'm talking about a more casual, but still dangerous, addiction – an addiction that won't let a player quit a game, or keeps a player coming back repeatedly to the same thing they swore they were done with. I'm talking the kind of addiction that decides that even though the bills are two months past due and the pantries are mostly bare, a monthly fee is small enough to let slide into their budget. The kind of addiction that lets players like you and me make decisions that are bad for our health, our families, and our lives.